This brass reproduction of a Victorian locket has been polished to bring up its highlights, then set with a vintage acrylic dome. Magnified under the dome is an image of a lovely old fashioned, full-blown pink rose. The locket is beautifully detailed. It is fairly old (I think it may have been stashed away in a warehouse for much of its life), and is showing a fair amount of rust on the inside - see the photographs. 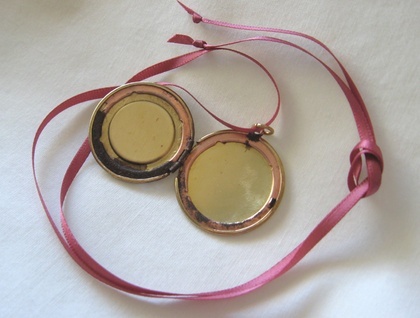 I did my best to get rid of as much rust as possible, and the structure of the locket itself is undamaged. If you are a lover of romantic shabby chic, this one is for you! The delightfully 'worn' discolouration on this piece can't be reproduced artificially. 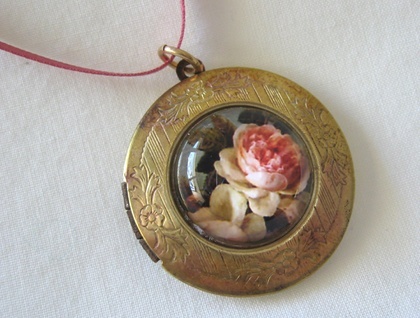 The Victorians loved lockets, and used to keep all kinds of things in them. They were worn inside or outside the clothing, by both men and women, including soldiers in battle, so that they could keep their loved ones close all the time. 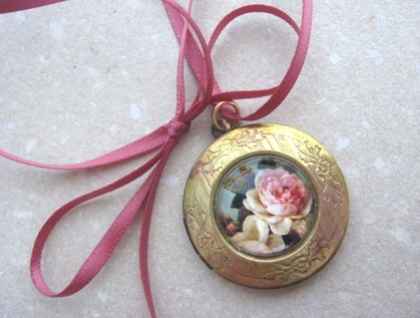 The locket is empty, ready for you to insert your own picture or photograph - maybe with a lock of hair from someone special, or a tiny piece of fabric or ribbon. It is firm to open and close. The locket is simply strung on a complementing, double-sided satiny ribbon, which can be knotted at your desired length. The ribbon holds bows and other knots quite well. The ribbon measures 65.5cm, not including the knots at either end. 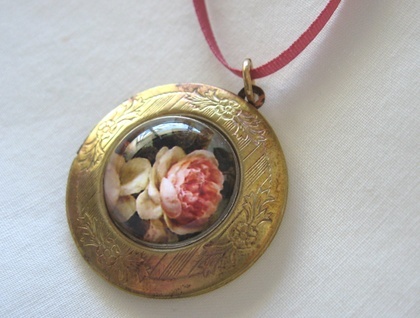 The locket measures 31mm in diameter. Silverlight Jewellery designs are handmade and unique - none of them will ever be repeated exactly, so you will never see another piece quite like yours. Each piece is named and numbered, like the work of art that it is! Silverlight Jewellery - exquisitely eclectic.